Each and every Indigenous Nation of Turtle Island was blessed with land and water, set aside especially for them, by Creator. All people of the Indigenous Nations are physically and spiritually aware of where their own “traditional” lands are found. I know well the sacred circles within the lands of the Algonquin Anishinabeg. Our traditional lands are vast, beautiful and resource-rich and they include the land on which the City of Ottawa is built. The traditional lands of the Algonquin were fully intact and provided well for us before contact with Europeans. My ancestors knew what their duties and responsibilities were to the land and waters Creator had given to them. Each territory contained laws instructing the People to heap praise on the gifts Creator had given them. No one objected. All members of the Nation gladly did so. The style of the canoes they built and the markings carved onto them were unique to the territory of the People living there. Things they wore on their heads and feet, the shape of their snowshoe, the design and artwork of their moccasins or mittens, were that of the Nation. Their very own copyright, you might say! Each Nation had their own version of what defined the death rites of their people. And they were fully aware that birthing ceremonies, customs related to marriage, water rituals, and so on, were those only of their Nation and that the said ceremonies differed in small or big ways to those of their neighbours to the east, south, west or north of their territory. The attire worn by our people at grand gatherings attended by People of other Nations, coming from near and far, was decorated with symbols which clearly told a stranger details of a person’s spiritual beliefs and the Nation from whence they came. The breath of our Creator inspired all of our traditions. The teachings of the trees, berries and flowers varied from one Nation to the next. Most certainly, all carried the word of a good message. The stories of the Nation, to teach the young, came to the storyteller through dreams and visions provided to him/her by the spirit of the land. Their traditional land. A most amazing muse, to be sure. The fish, animals and game birds of the territory responded to the drum of the hunter or harvester and the prey of the waters and of the field gave up their lives so the human being could live. The land was sacred. The People loved the land and its waters with the same passion as they loved the pureness in the hearts of their blood relatives at birth. It was so, and so it should continue to be. When Jason Arbour claims that a few names on a census from the 1870’s “proves” a reserve existed in Hull, Quebec, he proves only that the opposite is true. On a reserve of the 1870’s the Indian agent would have taken a head count of who was born and who had died on the reserve over the course of a year. The Indian Agent collected and gave these details to the Department of Indian Affairs. Census takers did not record the “Indians.” Census takers counted the inhabitants of the towns and cities of the country. I want to see photographs of the people Arbour claims “have no voice”. Surely, they occasionally came into contact with a camera. I want to see any documented plea (there must have been many) the chief of this reserve made to the federal government detailing any injustices they were experiencing on or near their “reserve”. I want a journal kept by a missionary priest which states his experience with the reserve to be produced. All priests working with Indigenous People kept journals. I want proof of when this reserve was founded and the exact date when it was extinguished. A “census” containing names of people identifying themselves as “Iroquois” or “Indian” does not impress me. I want to see a band list. Am I asking for too much? Today, there are thousands of Inuit living in Algonquin territory. The Inuit living here are recorded now on a census. Does this mean to say that in a couple of generations from now the Inuit will claim this Anishinabe land as “their traditional” territory? No, it does not. If they did so, they would be looked upon in a strange way. People would know that their claim was false. I need Jason Arbour to tell me who the chiefs were of the band he says his ancestry came from. Creating a reserve is no small thing to undertake. My home community of Kitigan Zibi can produce hundreds of documents related to how the reserve was lobbied for, who did so, who among the white people objected to it and, finally, why the reserve was eventually given the green light. Can Mr. Arbour produce such documentation? Much research was done by the federal government to establish beyond question the perimeters of Algonquin territory so that a land claim could be put in motion which might produce a fair settlement. Boxes and boxes of documents proving Algonquin title to our land (yes, even Ottawa) exist. Jason Arbour, the self-identified Algonquin, rejects it all. “It’s Mohawk land,” he roars. But only people who despise the Algonquin believe him. By claiming a part of the “Great River of the Algonquin” as territory belonging to an Indigenous Nation whose traditional lands are far, far away from here, Arbour attempts to erase us from history. To him, the Algonquin are a fantasy nation created by the early white settlers. I guess they did so to create confusion and discord in these modern times. Or it could be that Jason has been playing a bad joke on us all these many years. The joke has become stale. Let’s move on. I do not wish any ill will on this man, the product of settler stock, who wishes to destroy the Algonquin People. My only hope for him is that whatever it is Mr. Arbour wishes for me, let it come down on him twice as much. If it is love and blessings he wants for me, then goodness and healing are surely on their way for him. Again I say, I wish no ill will upon him. I pray for healing and wellness for all people living within the perimeters of Algonquin territory, especially the Ottawa region of it where my children and my grandchildren live. 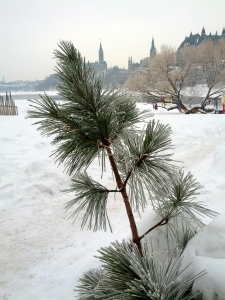 This entry was posted in Community, Idle No More, Spirituality and tagged Akikodjiwan, Albert Island, Algonquin, Anishinabe, Asinabka, Chaudière Falls, Chaudière Island, Iroquois, Kichi Sipi, Mohawk, Ottawa, Ottawa Citizen, Ottawa River, sacred land, sacred waters, spirituality, unceded, Victoria Island. Bookmark the permalink. William Commanda is half mohawk and algonquin he is turning in his grave the way you are going about this you should be ashamed yourself albert dumont. I am not sure where you are getting your information that William Commonda was half Mohawk….? I would be very curious about your source for this was…? “…Pakinawatik was born on the banks of the Kitigan Zibi (Desert River) during the winter of 1803, but it was not until the summer that he was officially baptized at the mission of the Lake of Two Mountains (Oka).” So, although baptized on traditional Mohawk Territory, he was not Mohawk. His baptismal took place (on Mohawk Territory) only as the Anishinabe utilized Oka, and area as a hunting and gathering place. but i believe he identified as Algonquin. If you remove my heart from my body, it will mean that what is left of me, will soon begin to decay. If you remove the Algonquin Nation from their heart (Akikodjiwan), it will mean that the sacred circle set before the People of the Great River by Creator has been defiled and corrupted and left by the people who allowed this to happen, to wither away, as does the memory of a beautiful bird, long ago become extinct because of the sins and foolishness of broken human beings. My dear supporters of the Algonquin People, my dear friends of Akikodjiwan, I call on you to be fierce in your protection of our sacred space. Let us stand together in solidarity against all who work to drive the Algonquin Nation from their traditional lands and holy places. I want my readers to know that I will no longer continue in a back-and-forth exchange with anyone who responds in a negative or a positive way on this topic. I feel that I have spoken. Everyone is now 100% clear on my position and my spiritual beliefs. I wish everyone much health and goodness and also safety at these times of treacherous weather conditions. May Creator watch over you and all your loved ones in the year 2018.